We are currently hiring cooks, cashiers, grill and fry people, bartenders, security, ticketing agents, mascot performers and more. 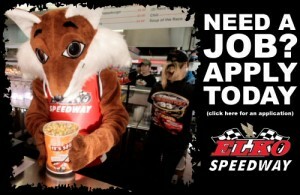 Positions available on a daily basis, working during show times at Champions Drive-In Theater and on Saturdays at the race track. See you this summer!